In 1986 Run-DMC released their 3rd album Raising Hell, which would go on to be the trio’s most commercially successful album, selling over 3 million copies. The success of Raising Hell can largely be credited to the addition of the former rocker turned hip-hop producer, Rick Rubin, who would help fine tune Run-DMC’s hip-rock formula, that they dabbled with on their second release, King Of Rock. In 1988 Rick left the Def Jam camp, and with the exception of one track, left Run-DMC to fend for themselves for beats to back their rhymes on their fourth release Tougher Than Leather. I’ll be honest. I respect what Run-DMC did for hip-hop (hence the reason for the purchase of this album), but I’ve never been a huge fan of their music. This is partial do to the fact that I was a young buck when they were in their prime, but more so because neither emcee was ever a great lyricist (Run was obviously the more polished emcee so you can only imagine what I think about DMC). Needless to say I’m not too excited about this review, but maybe a fresh listen to an old album will surprise me. Run’s House – Those of you under 25 who are not familiar with Run-DMC catalog will probably only recognize this as the theme to MTV’s reality show of the same name, based around Run’s family. Over an uptempo and phat drum beat, Run and D welcome the listener to tonight’s show. I loved the horns used at the end of the track, would have been interesting to hear them incorporated throughout the song. Since the song title suggest this would be a Run solo, I’ve always wondered how D felt about rapping over a song that was pretty much dedicated to Run. It’s obvious who the main emcee is, but D (surprisingly) matches Run’s energy and this turns out to be an enjoyable listen. Mary Mary – Run and D craft a tale, based around The Monkees song of the same name, about a crafty honey, that either they both were involved with (which could be a true story, as I’m sure they’ve shared their share of honeys in their rock star days) or two different chicks named Mary. Regardless of the logistics, both Joey and Darryl need a hug from “Mary”. The lyrics are forgettable, but Rick Rubin’s only production credit on Tougher Than Leather is a gem that sounds better today then it did 20 years ago. They Call Us Run-D.M.C. – This was boring and very forgettable. I just listened to it and the only thing I can remember about it is the stuttering rhyme style (which wasn’t impressive). But my opinion may be influenced by the fact that I’m writing this while Caribbean videos are playing on the tv in the background taking my attention away from this write-up. Hey, it’s not my fault Jamaican girls are hot! 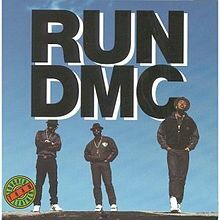 Beats To The Rhyme – This might be my favorite Run-DMC’s song of all time, mainly do to the bangin’ track. Run, and even D, sound nimble on the mic (I love Run’s boast about “clockin endless ins”), and they sounds even better when Jay adds in vocal scratches throughout, making it feel like a true group effort. This is hot! Radio Station – “Beats To The Rhyme” transitions seamlessly into this song, which is Run & D’s ode to the Radio Station… well, not really but will roll with it. Interestingly, to me at least, this is the second write-up in a row to sample Chuck’s line from “Rebel Without A Pause”. The beat is serviceable, and Run proves that this is indeed his house, rapping circles around his partner in crime (which shouldn’t be a surprise to those familiar with the group’s catalog). Thank mainly to Run, this was a decent listen. Papa Crazy – I have over 800 hip-hop albums in my collection, with songs that cover just about every topic (some topics covered way too often: ie money and hoes) . It was easy for me to put together a Mother’s Day playlist on my Ipod, celebrating the love and appreciation rappers, not name Eminem, have for Mom Dukes. But of the thousands of songs I’ve listen to, I’m still unable to compile a suitable Father’s Day playlist. This song is a prime example of why. Joseph and Darryl continue the hip-hop tradition of calling out their cheating, broke, deadbeat, sperm donor daddies. The beat samples The Temptation’s “Papa Was A Rollin’ Stone”, and walks a fine line between intricate instrumental work and intentional pop appeal, meaning it works depending on which side of the bed you wake up on the day you’re listening to it. Happy Father’s Day! Tougher Than Leather – The boys bring their signature rock guitars to the party for this one. While there are a few interesting licks here and there, overall the track didn’t move me, which also rings true about Run and D’s rhymes (which end up amounting to annoying yelling). It’s always disappointing when the title track of an album’s a let down. I’m Not Going Out Like That – One thing I’ve noticed throughout Tougher Than Leather is Joseph and Darryl’s attempts to update their rhyme schemes and deliveries to match the new jacks of the time (i.e Rakim, Big Daddy, Kane, etc. ), this might be their most glaring attempt. Run (who more often than not can pull it off) and D sound terribly uncomfortable when delivering there rhymes over this forgettable beat. How’d Ya Do It Dee – In an effort to even the score for “Run’s House”, we get a song title that would make one assume it’s a Darryl Mack solo joint. “But just like “Run’s House” both emcees get a shot at the mic (not sure why they didn’t just give each emcee his own song, or at least change the title of these two songs to something more group orientated). The beat’s minimalism kind of works and this turns out to be an okay listen. Miss Elaine – Over another rocked-out beat, Run and Darryl share a fantasy every teenage boy can relate to: hooking up with that hot teacher you use to have wet dreams about. Joseph and Darryl’s rhymes are entertaining enough to hold your attention, making this a fun listen (at least to the fifteen year old boy who still lives inside of me, and can still see my 8th grade french teacher Ms Berglund in all her short-skirted-double D glory…I think I need a moment). Soul To Rock And Roll – This might be the only time I’ll ever say this: Darryl actually sounds better on the mic than Run, largely do to Run screaming his lyrics to the point you have no idea what he’s saying. But the beat is so boring you’ll forget everything about this song. Sorry, Darryl. Ragtime – Over a lighthearted (and borderline cheesy) instrumental Run and Darryl deliver playful lyrics (this sound like something Fresh Prince would have done) that match the beat perfectly. The storyline was boastfully comical, making this a fun listen and a decent way to end the show. Tougher Than Leather is plagued by inconsistent beats and hit or miss rhymes. There are 5, maybe 6, decent to good songs on the album, resulting in an overall average listen. Sadly, this would be the last half decent album from the trio (their last three albums found the boys in black suffering an identity crisis, as they chose to follow the trends in an attempt to stay relevent) before they would fade into hip-hop obscurity. But thanks to the reality tv phenomenon, Run was able to resurrect his celebrity status decades later. What’s the point of reviewing Run-DMC if you’re not even a fan? I’m sorry, I was kind of pissed off when I first read this. It’s just for a while, most people haven’t given Run-DMC any credit for anything they did in hip-hop. Off their influence alone, they’re the greatest rap group of all-time in my mind. I always loved this lp. There energy is what makes them great. They will never be known as great rhyme writers, but I remember when everyone from the early era was biting there style. I will say they should have made this their last album. All I got to say is Beats To The Rhyme is one of the greatest instrumentals hip hop has ever seen. You’re right. It should be the best song RUN-DMC has ever done.